Union Valley is involved in many Mission activities that provide a place for everyone to serve and opportunities to share God's love with those around us. We also have a mission education ministry through Women on Mission, Royal Ambassadors, Girls in Action and Mission Friends. Below is a brief description of some of our past mission projects. The Call House is located beside our church. We support the Call and work with them in many different ways throughout the year to help meet the needs of foster children in our area. Siloam Springs Church Camp Mission Trips: Several members of UVBC go to Camp Siloam during the year to work on projects to help improve the camp. We have repaired roofs, cleaned and improved prayer garden, worked on counselors dorms, and planted flowers. Christian Outreach Center in Beebe have food delivered and some of our men and women volunteers help unload their trucks. Every Monday we have men go pick up food from local business that donate to the COC. The Women on Mission at UVBC also volunteer their time to help the COC. Crisis Pregnancy Center in Beebe: We have clothes drives and raise money for the center. We also help raise money for the center through their annual golf tournament. AR Baptist Disaster Relief chainsaw teams and feeding crews. Several of our members are trained to serve on these teams and go serve when called. Women on Mission do projects each month. For example they collect coats for the VA homeless veterans home, help Jacob's Place in Searcy, organize emergency food bags for UVBC, visit Beebe Nursing Home, do specific projects for The Call and Beebe Pregnancy Center. Backpack ministry we provides food for the Beebe Public School to give to students. Easter Egg Hunt and Easter story for the community on Easter weekend. Nashville TN Mission Trip for our Youth Choir and Drama Team in June. GOOF Children's Summer Program had a ministry/mission day at the AR Baptist Children's Home in Monticello. Haiti Mission Trip, several members of our church went. July 4th we provide food for the Beebe Community fireworks event. Feed and provide refreshments to Beebe Football Team throughout the season. Feed Beebe School Teachers before school starts. Prayer Walk prior to See You At The Pole and we provide food the morning of the event. Acts One Day Mission Trip to North Little Rock. Fall Festival for the community on Halloween. Operation Christmas Child we collected 500 boxes. Thanksgiving Food bags for needy families. China Mission Trip, Bro. Tommy went with his son. Christmas Angel Tree gifts and food for needy families in our school district. Women on Mission do projects each month. For example they collect coats for the VA homeless veterans home, organize emergency food bags for UVBC, visit Beebe Nursing Home, do specific projects for The Call and Beebe Pregnancy Center. Tulsa OK Mission Trip for our Youth Choir and Drama Team in June. Wichita Kansas Mission Trip in July to help start a new spanish church. Acts One day Mission Trip to Hermitate, Augusta and McCrory. Operation Christmas Child we collected 400 boxes. Armenia Mission Trip with several of our members in October. Christmas Angel Tree gifts and food for needy families. Easter Egg Hunt and Easter story for the community in April. Bro. Brian traveled to Ukraine with the AR Master Singers on a Mission trip. Several members helped with the Disaster Relief cleanup work in Vilonia, AR during the months of April and May. One Day Mission trip to Griffithville, AR: several of our member helped with a associational block party in that city. Cincinnati, OH Mission Trip for our Youth Choir and Drama Team in June. Haiti Mission Trip in June, several members of our church went. GOOF Children's Summer Program had a ministry/mission day in Beebe in June. Beebe Fireworks Outreach at the City Park on July 4th we gave away free food and invited families to our church. Armenia Mission Trip in August, seven members of our church went there to share the gospel. Fed Beebe School Teachers lunch and prayed for them in Aug before school started. Block party in Beebe at Ms. Cindy's house in August as a back to school party to invite families to our church. El Dorado One Day Mission Trip in October, several of our members helped with this event sponsored by the ABSC. Nebraska Mission Trip in October, four of our ladies went with our associational missionary to help start new churches in NE. Several of our members went to Siloam Springs Church Camp and worked on repairs at the camp in October. Siloam Springs Church Camp Mission Trip: Several members of UVBC worked at the camp on several different dates . We repaired roofs, cleaned and improved prayer garden, worked on counselors dorms, and planted flowers. The Wordsearcher's Class visit the Beebe Nursing Home once a quarter and visit with the residents and sing. Christian Outreach Center in Beebe have food delivered and our men help unload their trucks. Crisis Pregnancy Center in Beebe have clothes drives and raise money. Disaster Relief chainsaw team worked around Beebe in March and went to Oklahoma in June to help clean up after storms. Family Mission Day at the LR Zoo on March 9, 2013 with the children of our church. Send Me Bazzar, Feb 18th, yard sale to raise money for Armenia Mission trip. NYC Muslim Women's Mission Trip in March to share with gospel in March. Easter Egg Hunt and Easter story for the community in March. Nicaragua Mission Trip in June, four members of our church went. San Antonio, TX Mission Trip for our Youth Choir and Drama Team in June. Haiti Mission Trip in June, seven members of our church went. Armenia Mission Trip in June, seven of our members went. July 4th our church served free food to the community fireworks event. Armenia Mission Trip in August, seven members of our church went there. Meet the Badgers Cookout and Showed the movie "Facing The Giants" in Aug to show support to the Badger Football Team. Mission Trip to Memphis TN at Leawood Baptist Church, to help with their Fall Fest Oct 26, 2013. Angel Tree Christmas ministry in Beebe School District in December. Operation Christmas Child, we deliver all the boxes our Awana children and their parents collect. Fall Fest is a community wide outreach in October. Disaster Relief chainsaw team went to Louisiana in September. Fed Beebe Public School Teacher's in September and had a time of prayer with them. Memphis Mission Trip on September 8 to help Chris Miller's church. Armenia: Twelve women of our church traveled to Yerevan, Armenia in March to share the gospel and help start a church. Star City First Baptist Church: The Wordsearcher's Sunday School Class has traveled to Star City several times to help do remodeling work on their church. West Africa: Four members of our church traveled to West Africa in May to share Bible stories in villages. Women on Mission: Do monthly mission projects like collect hats, gloves and jackets for the homeless, make baby quilts and bring baby gifts for the pregnancy crises clinic in Beebe, and purchase items from World Craft to help support International Missionaries. Disaster Relief: After a storm in April our DR Chainsaw crew went to Sherwood and helped cut trees for two days. We had a total of 14 members help. Armenia: Eleven women of our church traveled to Yerevan, Armenia in April to share the gospel and help start a church. Siloam Springs Church Camp Mission Trip: 10 members of UVBC worked at the camp March 24-26. We did construction work on the inside of the cafeteria and painted some of the outside, raked leaves and cleaned flower beds. 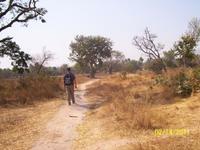 West Africa: Four members of our church traveled to West Africa in February to share Bible stories in villages. Men's Siloam Springs Mission Trip: April 5th-8th: 15 Men from our church worked on the roof of the cafeteria at the camp. Boonville Baptist Church came and worked with them also. We removed all the old shingles and put a metal roof on the main building and new shingles on the side rooms. Youth Siloam Springs Mission Trip: April 9th-10th: 32 Youth from our church went to the camp April 9-10 and worked at the camp. We cut trees and removed limbs from the hill where the obstacle course is located, we painted some outside structures, moved some beds around in the doom's and racked leaves and picked up sticks. Baptist Builders: Two of our members helped the Arkansas Baptist Builders work on Glenwood First Baptist Church. Children's Mission Day February 13: We had 8 children and 4 adults deliver gifts bags to the widows, widowers, and older senior adults of our church. All the items in the gift bags were donated by children and adults in our Awana program as the January Mission project. Several men from our church traveled on three different weeks around Arkansas helping with Disaster Relief Chain Saw and Feeding units following several ice storms in January. Children's Mission Day February 14: We had 14 children and 6 adults deliver gifts bags to the widows, widowers, and older senior adults of our church. Then we carried gift bags to the Beebe Nursing Home. Several of our members served with the AR Baptist Builders at Lynnwood Baptist Church to do some repair work on the church building. Several of our members worked at the Arkansas Baptist Assembly in Siloam Springs on several different dates. They did repair work on the staff dorms, children's dorms, and did improvement projects to the Children's Worship Center. Forty Children and Adults from our summer GOOF program visited the Boys Ranch in Harrison to delivery money and gift cards we collected during VBS July 2009. We had 150 members work in the Judgement House Oct. 21 - 24, 2009. We had 75 people from our church work in our third annual Christmas Store on December 5, 2009. We served 79 families by providing free Christmas gifts for their children and a box of food. Several men from our church helped Bethel Baptist in Jacksonville, AR in January work on installing ceiling tiles and insulation above the tiles, doorknobs, and baseboards. Some men from our church went to Cleveland, AR and helped clean up around one of our member's parents home after a tornado 02/07/08. Several members went to TX and LA in September to work on Southern Baptist Disaster Relief Chainsaw and Feeding Units. Several members of our church went to work on the Siloam Springs Church Camp for one week in October and one week in May. They did construction repairs on the counselors dorms, painting in the Children's Worship Center, and light grounds work. Judgement House: October 29-November 1st we had 120 members of our church serve in our third annual Judgement House presentation. Judgement House® is an eight-scene walk-through drama, which effectively presents the gospel. Visitors are led through a series of rooms that tell a story about lives that are cut short through tragedy, and they see dramatically how their deaths impact their family and what they experience beyond the grave. We saw over 100 peopled saved this year. Christmas Store: December 6th we had 75 members of our church serve in our second annual Christmas store where we provide free gifts and food to families in the Beebe school district. Several men from our church served in the Southern Baptist Disaster Relief Team and traveled to Missouri to help with the clean up after the December 2007 ice storm. New Mexico - VBS & Repair Work 2007: Thirty four people from our church traveled to Gallup New Mexico in July 2007. We worked at the Iyanbito Baptist Church on the Navajo Laguna Indian Reservation. During the day we had VBS. The Lord brought 110 children to VBS and 30 of them accepted the Lord as Savior. During the afternoon the men did construction work on the church to replace the floor, repair the roof and other small projects. During the evening Bro. Tommy Miller held revival services. Four adults and one child accept Christ during the revival. Continue to pray for Bro. Harry Natoni and Mrs. Carol Willie as they serve the Lord at Iyanbito Baptist Church and as they wait for their new pastor to arrive. Montana - VBS & Repair Work 2006: Twenty nine people from our church traveled to Wolf Point, MT in July 2006. We served the Lord at Morning Star Baptist Church, pastored by Bro. Ray White Tailfeather. During the day the men repaired a wheelchair ramp and put up a new privacy fence. At night everyone helped put on a Vacation Bible School at the church. We had 143 children attend VBS, and we praise the Lord for the 36 children that accepted Christ as their savior while we were there. We also saw three people saved as we went door to door visiting there in Wolf Point. Wolf Point is located in the Ft. Peck Indian Reservation in north east Montana. Hurricane Katrina and Rita 2005 & 2006 : We have had several groups of men and women travel to Louisiana and Texas to work with the Southern Baptist State Convention's Disaster Relief Teams. Our members have been serving on the feeding crews and chainsaw crews. Montana - VBS & Repair Work 2005: Thirty nine people from our church traveled to Wolf Point, MT in July 2005. The men worked on the Morning Star Baptist Church during the day repairing the the fellowship hall, wall in the sanctuary and outside side walk. At night everyone helped put on a Vacation Bible School at the same church. We praise God for the 28 children that accepted Christ as their Savior while we were there. China Mission Trip 2005: Chris Miller, the preacher's son, traveled to China this summer with a group from Williams Baptist College. He spent eight weeks away from home on this mission trip. This was Chris' second mission trip to China. Men's Mission Project 2005: Several of the men of our church helped put a roof on a pastor's house in Batesville in June 2005. El Paso - VBS 2005: Several people from our church went to El Paso, AR to put on a Vacation Bible School June 27 - July 1, 2005 at the El Paso First Baptist Church. We had a great turn out of children and helped spread the gospel of Jesus Christ to their community. 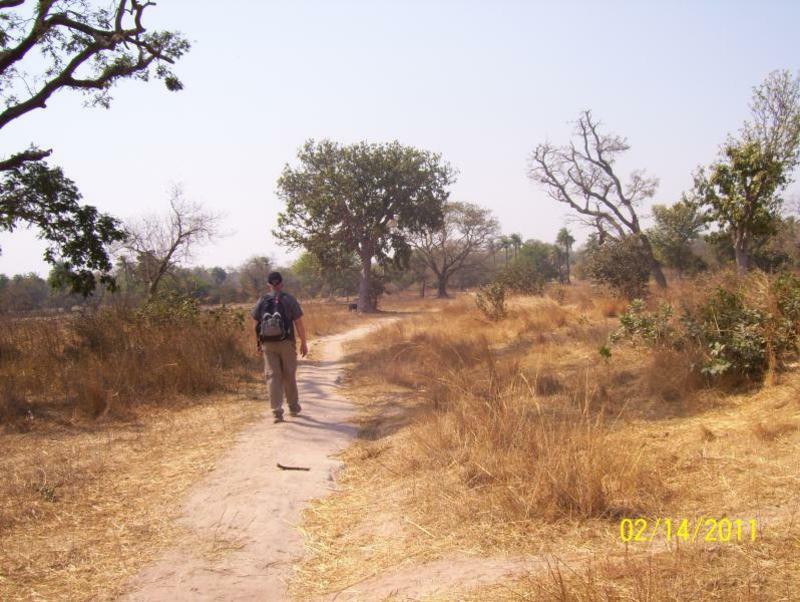 Africa Mission Trip 2005: Our Pastor, Tommy Miller, went to South Africa in May. He preached in Johannesburg, he walked the streets witnessing, and he rocked babies in the Hole In The Wall Orphanage. He taught members of Berea Baptist Church how to set up a Sunday School and Children's Programs. Be in prayer for the city of Johannesburg as the message of Jesus Christ is being shared by missionaries daily. Florida Disaster Relief 2004: Five people from our church that are members of the Southern Baptist Disaster Relief Team traveled to Florida to help with the clean up and food preparation after the hurricane. South Dakota - Roof Church & VBS 2004: Twenty five people from our church traveled to Mobridge, South Dakota in July 2004. The men traveled 50 miles each day Aberdeen to replace a roof on the Aberdeen Baptist Church. The women put on a Vacation Bible School at the Baptist Church in Mobridge. Beebe Christian Outreach Center - The Christian Outreach Center is sponsored by the Beebe Ministerial Alliance to provide low cost (or no cost for those that qualify) food and clothing. The Center is open Tuesday, Thursday & Saturday 8:00 am - 12 noon. The Center is located at 105 East Center, Beebe, Arkansas. There is no phone at this location. They accept donations anytime they are open. A Women's Place - A Women's Place is a crisis pregnancy center in Beebe that opened January 2006. It is located behind the Consignment Store in downtown Beebe on Main Street (old Otasco store). Park in the lot behind the City Library and entry through the back side of the consignment store building. They will be open on Friday’s from 9a.m. - 4:30 p.m. for anyone in our community that needs help during a crisis pregnancy. They are still looking for volunteers to work in four hour intervals. If you are interested in applying to work there contact Vickie Parker at 605-6360. Shepherd Center - The Shepherd's Center of Beebe is an interfaith, nondiscriminatory organization whose purpose is to promote personal and spiritual growth and to help maintain dignity, independence and continued productivity. It links older adults together in conceiving, planning and implementing services and programs that enable some persons to live independently and others to find meaning for their lives through being of help to others. They are located at College and Cherry Streets, Beebe, AR. 501-882-0243.